Healthy skin is smooth, even-toned, firm, and radiant. These key elements work together to create a beautiful complexion. However, the same characteristics can easily be affected by aging, environmental factors, genetics, and more. That’s why you need a non-surgical treatment that can restore your skin’s health and beauty. The elos Plus skin rejuvenating system by Candela is a great option. This energy-based system features three different applicators to improve a broad spectrum of cosmetic concerns. At Miami Skin and Vein, we can help make your aesthetic dreams a reality. Call 786-618-5039 today to schedule your elos Plus consultation or treatment with Dr. Shaun Patel. We gladly serve patients from Miami, Coral Gables, Miami Beach, Ft. Lauderdale, and nearby areas of Florida. As a multi-application device, elos Plus can deliver beneficial optical, radiofrequency, and infrared energy. The system offers three unique treatment handpieces that can be used alone or in any combination. The elos Plus treatments include SRA (essentially a form of IPL), Sublative (also known as eMatrix), and Sublime. The incredibly effective combination of all three treatments is called Triniti Plus. The treatment sessions are short. Patients with light skin types may benefit from all three treatments. Patients with dark skin types may benefit from Sublative and Sublime treatments. This device can treat a wide array of aesthetic concerns. The treatments are incredibly customizable. You can resume your normal daily routine after a treatment, with some aftercare. What Can elos Plus Treat? The elos Plus system combines several powerful forms of energy – optical, radiofrequency, and infrared — in one device. These safe energies can treat an incredible range of skin concerns. Your top aesthetic issues are no match for this advanced treatment. Depending on your skin concerns, you may benefit from a treatment that uses one or more elos Plus handpieces. 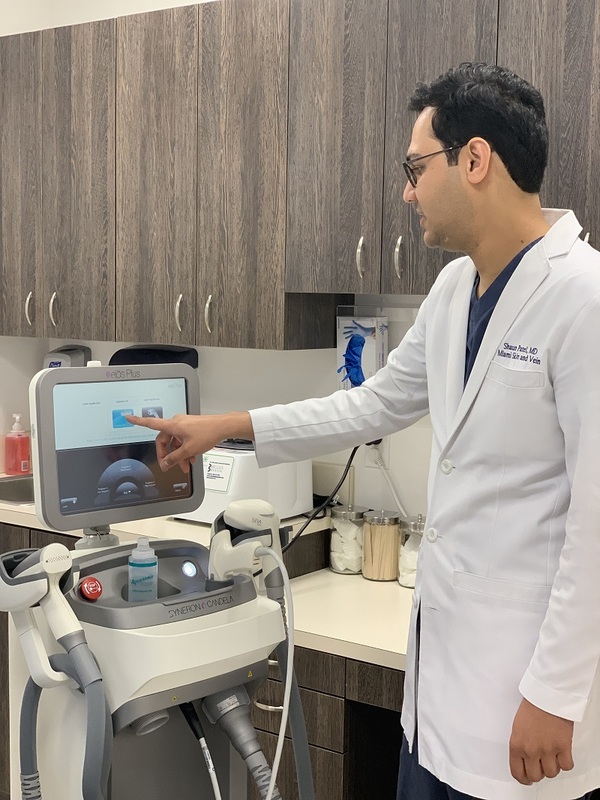 Dr. Patel will examine your skin and make a personalized treatment recommendation during your visit to our Coral Gables clinic. SRA (IPL Treatments): This handpiece uses broad-spectrum wavelengths of light energy to offer a safe and effective intense pulsed light (IPL) treatment. The treatment combines optical and radiofrequency energy to address pigmentation concerns. IPL — also known as photo rejuvenation or a photo facial — is an incredibly popular skin service. IPL treatments are designed to provide amazing color correcting benefits. This treatment may be ideal for you if you suffer from red or brown discoloration on the surface of the skin caused by prominent blood vessels and sun exposure. Sun spots, age spots, rosacea, and facial redness are commonly treated with IPL. Sublative: This handpiece uses a matrix of fractionated bipolar RF energy. Essentially, the RF energy creates a pattern of micro-injuries in the skin. These injuries, combined with the gentle heat from the treatment, encourage collagen production and collagen remodeling in the skin. You may benefit from Sublative rejuvenation if you want to treat textural issues, enlarged pores, and acne scars. Sublative can also improve brown pigmentation issues, especially when combined with SRA (IPL). Sublime: By utilizing RF energy and infrared energy, the sublime handpiece gently bulk heats the dermis. This heat can effectively stimulate new collagen growth and create a helpful inflammatory response. The new collagen will help lift and tighten your skin in the treatment area. You may benefit from a Sublime session if you want to improve mild skin laxity. While this treatment will not replace a neck lift or facelift, it is an excellent option for people who are not interested in pursuing cosmetic surgery. Triniti Plus is the term used to describe a treatment session that involves all three handpieces. This treatment starts with IPL, continues with Sublime, and then finishes with Sublative. Dr. Patel may recommend Triniti Plus if you have multiple aesthetic concerns such as discoloration, skin laxity, and uneven skin texture. This treatment will likely encourage a dramatic overall improvement in the appearance of your skin. Patients tend to see remarkable results after Triniti Plus because it addresses virtually every sign of facial aging. Before your treatment, Dr. Patel will discuss what you can expect from your unique elos Plus session. This may vary depending on the handpiece or handpieces that he intends to use, as well as the treatment area. He will give you detailed before and aftercare instructions, which can also be found here. Topical anesthetic ointments are sometimes used before an elos Plus session to minimize any potential discomfort. Depending on your treatment, you may experience a mild warming or prickling sensation as Dr. Patel maneuvers the appropriate handpiece over your skin. The treatment should not be painful. To schedule an elos plus consultation or treatment with Dr. Patel, please call 786-618-5039. At Miami Skin and Vein, we welcome patients from Miami, Coral Gables, Miami Beach, Ft. Lauderdale, and nearby areas of Florida.